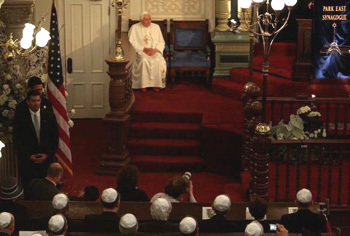 BENEDICT XVI’S VISIT TO A NEW YORK SYNAGOGUE – For those who understand the meaning of things, one of the most important episodes in Benedict’s recent visit to the United States was the 22 minutes he spent at Park East Synagogue in New York City. Indeed, nothing has been more constant and intense in History than the fight between Judaism and Catholicism. Although both issued from the Old Testament, the coming of Our Lord Jesus Christ, the true Messiah awaited by the Prophets, would deeply divide those two beliefs. The Pharisees pretended that their messiah should come in glory to exalt Israel over all nations. This hope was wrong in part because it was based on Prophets who prefigured the second coming of the Messiah in glory and majesty. But it was chiefly wrong because it was founded on the Pharisees’ own pride. Jesus Christ fulfilled other promises of the Prophets that referred to the first coming of the Messiah and foretold He would come in humility and poverty, opening the gates of the elect to all peoples and instituting the spiritual Israel, the Catholic Church, which should reign over all peoples. This fulfillment of the prophecies by Our Lord’s Church did not flatter the Pharisees’ pride; far from that, it set off their revolt. We know the rest: as Our Lord proved Himself to be the true Messiah through His doctrine and His miracles, the Pharisees hated, persecuted, and finally crucified Him. Thenceforth this hatred did not cease. On the contrary, wherever the Catholic Church would be founded, there Judaism would persecute her. The saying of Tertullian became proverbial: Synagogae Judaeorum fontes persecutionum [The synagogue of the Jews is the source of the persecutions]. The first persecutions against the Christians, the heresies, the destruction of Christendom by means of Protestantism, the French Revolution and Communism all counted Jews among their inspirers or great allies. There is no need to repeat here what I have already proved elsewhere. After WWII, taking advantage of the pagan brutalities Nazism made against their race in the period of 1936-1945, Judaism began to play a fraudulent game. It pretends that anyone in History who was or is against its religious principles is either a Nazi, or at least he shares the Nazi’s anti-Semitic hatred. It is dishonest because it confuses belonging to the Jewish race with believing in the principles of Judaism. It hides Jewish doctrinal errors behind a supposed racial hatred. This subterfuge is as dishonest and absurd as if someone were to say that Catholics are anti-German because they are anti-Protestant, or that they are anti-Arab because they are anti-Muslim. What in fact we as Catholics affirm is that Judaism is wrong because their main representatives rejected and murdered the true Messiah they were called to receive. Jewish leaders throughout History, including our times, have maintained the same pertinacity in this error. We consider the attempt of Vatican II to place this bi-millennial antagonism between parentheses as also fraudulent. Judaism did not change one comma of its old errors, but rather added to them. The Progressivist Vatican pretends that a midpoint agreement between Catholicism and Judaism can be reached. But in reality there is no possible accord. The only thing that happens is an increasing capitulation of the Conciliar Popes to Judaism as it is and always was. This 40-year-old progressivist course of action was confirmed and reinforced by the visit Pope Ratzinger paid to the New York synagogue on April 17. I will analyze what happened in those 22 minutes as related in The New York Times (April 18, 2008, Sewell Chan, "The Pope Makes First Visit to a US Synagogue"), which was the most complete report I found online. Benedict entered the Park East synagogue as a choir sang the liturgical song Sh’ma Yisrael, which is the central proclamation of faith of Judaism. That is to say, at the very moment of the entrance of the Vicar of Christ, the Jews re-affirmed that they do not accept Our Lord Jesus Christ. Then, he was invited to sit at the left side of the stage (bimah), a secondary place. Soon after this, an elder member of the synagogue drew back a heavy velvet blue drape and the scrolls of the Torah were exposed for public veneration. 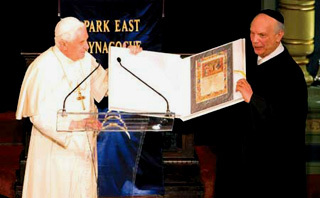 With this gesture, which Benedict had certainly agreed to before the ceremony, he endorsed this symbolic display of the religious books of Judaism. This should cause no real surprise since the progressivist theologian Joseph Ratzinger often referred to the Catholic Pentateuch as the Torah, adopting the Jewish terminology. He told the Pope that the Jews “embraced the law that governs the relationship between man and God.” These words sound like a reaffirmation that the Jews were and continue to this day to be the elect people of God, which is false. 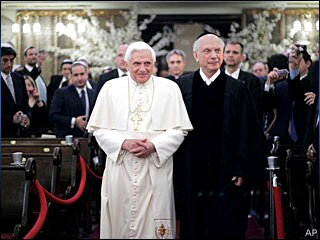 He stressed the importance of Benedict’s visit for Catholic-Jewish dialogue. He recalled the Jews who were killed in WWII. He mentioned that “our love for God can never come at the expense of our love for His children,” which in context was a clear reference to the fraudulent game I mentioned above, whereby Catholics would have also had an anti-Semitic, racial hatred for Jews. In synthesis, the rabbi’s words, along with the opening ceremony, were clearly intended to reaffirm the old errors of Judaism, along with a complaint that the Catholic Church - until Vatican II - was indirectly responsible for the Nazi persecutions as well as other maltreatments through History. 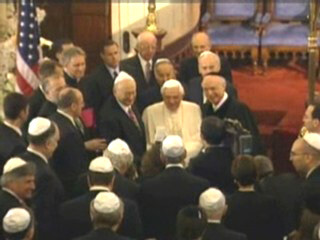 First, he greeted the Jewish leaders with the word shalom, peace in Hebrew. It was a first concession, showing that the Catholic Church is adopting the Jewish language. Ignoring the murder of Christ, Benedict found “it moving to recall that Jesus, as a young boy, heard the words and prayed in a place like this.” This implies that Catholics should consider Jesus as a follower of the Jewish rites, disregarding His mission as Messiah and Redeemer. Again, a sabotage of Our Lord’s mission. After some inexpressive words of courtesy, Benedict said: “I assure you most especially of my closeness at this time [of Pesah], as you prepare to celebrate the great deeds of the Almighty, and to sing the praises of Him who has worked such wonders for his people.” With these wishes he implied that God is as pleased with the prayers of Judaism as he is with those of His only true Church. Even more, he implied that the Jews continue to be God’s chosen people. A large number of errors summarized in a short speech of greeting. Undoubtedly the Vatican expert who worked on this text has the gift of synthesis. After that, Benedict and Schneier exchanged gifts. The former presented a replica of a Jewish medieval legal manuscript, a way to affirm that the Jews always had the Law on their side. The latter gave to Benedict a Passover prayer book, another implication that Benedict should learn how to pray from the Jews if he wants to really please God. He also gave Pope Ratzinger a box of matzo, a kosher flatbread, the symbolic bread the Jews eat at Pesah in remembrance of their flight from Egypt. After Benedict greeted and shook the hands of 20 of the roughly 100 Jewish leaders present, he left the synagogue, stopping on the way out to praise the children’s choir.